El Madroñal is an area known for country chic in the hills immediately above Marbella. Adjoining the renowned La Zagaleta country club, this private gated community is home to luxurious villas set upon lush grounds surrounded by a private cordon sanitaire of untamed nature. 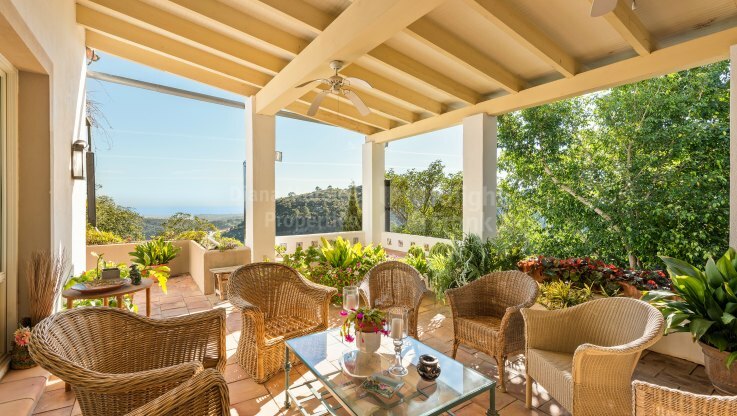 Put differently, living in El Madroñal comes with space, privacy and some of the most imposing sea, mountain and country views in Marbella. One of the finest of the rustic chic homes to be found in El Madroñal is this exquisite villa featuring nine bedrooms set within a main house and a separate guest cottage. Together they offer 1,000m2 of living space, with over 100m2 of undulating terraces that make the most of a panoramic setting in which spectacular sea views over the Mediterranean are framed by the intense greenery of El Madroñal. From this position the world is peaceful, private and awash with beauty. The gates open to a forecourt with double garage, revealing a delightful fountain and architectural details along the way. The main villa is entered through a solid Ronda wooden door, which forms the threshold to an entrance hall that is at once impressive and welcoming. From here one enters an equally elegant and cosy drawing room that leads on to an even sunnier reading room and a formal dining room that shares the wonderful views enjoyed by virtually every part of the home. A more informal dining room, ideal for large parties occupies a particularly scenic position, with windows that open up and direct access to a peaceful part of the terrace that contains a small herb garden. It is connected via the laundry/utility room to a wonderful country kitchen whose charm, elegance and contemporary convenience symbolises a property whose bearing and refinement cannot be achieved overnight. Follow the stairs and you come to the private quarters with master bedroom suite. The upper floor also contains a private office and, set within a separate wing, an independent apartment. The swimming pool, which features a retractable cover and can be used throughout the year, is situated along a panoramic pool deck near the guest cottage. The latter offers lucky visitors several bedroom suites, along with independent kitchen and lounge area, with another swimming pool complete with pool cabana located a little further down the gorgeous yet practically laid out gardens. It provides an oasis of peace and wellbeing amid gorgeous greenery and impressive views, epitomising the country chic sophistication for which El Madroñal is known. The villa in question occupies just over a hectare of its finest land and is the product of a long labour of love that has resulted in a beautifully balanced and refined home in the hills above Marbella.